« But It’s Football . . . It’s College Football . 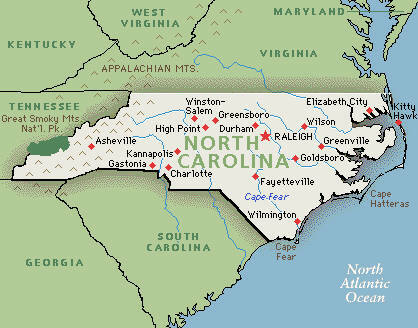 . .
Geography put North Carolina in the Upper South, made it hard for the state to thrive in the antebellum economy (a regressive state constitution didn’t help), but made it easier for the state – especially its Piedmont – to grab hold of the various “New South” projects with a grip unmatched, except for maybe Atlanta’s. Former Charlotte Observer editor Ed Williams, a Mississippi native, said of North Carolina, “In this state, there was a fierce and ceaseless battle between the forces of enlightenment and reaction, and, unlike in most of the South, the outcome was not a foregone conclusion.” The standard narrative and popular conception – inside and outside the state – emphasize the battle, that North Carolina at least put up a good fight against its worst impulses and “the burden of Southern history.” Before any North Carolinian pulls a muscle reaching to pat his own back, though, he would be wise to remember that enlightenment lost the battle at least often as it won, that post-Reconstruction North Carolina has been home to the only armed coup of an elected government in U.S. history, “Bloody Gaston,” at least 168 lynchings between 1865 and 19411, the 1979 Greensboro Massacre, and – for 30 years – Senator Jesse Helms. Still, the rest of the South tends to look at North Carolina and see Chapel Hill, as wayward and subversive in its sociology department as in its preference for the Smith Center. They see Asheville, with its high-end resorts and hippie enclaves. They hear the nasally voices of all the halfbacks (who left the Northeast for Florida, missed changing seasons, and moved halfway back) and the in-migrants working high-tech or high-creativity jobs in the Research Triangle Park (some look askance at our having a Research Triangle Park in the first place). They see Charlotte, as gleaming and as gridlocked as any Northeastern metropolis. A hotel clerk in south Georgia once asked where I was from, and said, “Well, that’s almost the South,” when I told him2. My own wife, Alabama-born and bred, told me, when we were dating, that she’d never thought of North Carolina as “really” the South, though she did think so of Virginia, and I must “really” love her since I married her anyway. I love The Daily Show, which won a much-deserved 10th consecutive Emmy Award last night. You know what other show won big at the Emmys? Homeland, filmed in Charlotte, as were The Hunger Games and Talladega Nights and – um – the last season of The Bachelorette. The Emmy broadcast honored the late Andy Griffith. One presenter mentioned that another presenter hailed from North Carolina; he doesn’t, actually, but Emmy-winner Julianne Moore does. So do this guy and this guy and this guy’s parents. 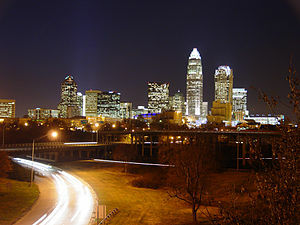 Charlotte is the 17th-largest city in the U.S. – bigger than Detroit, Boston, Seattle, Denver, and Washington, D.C. – and is at the center of the 33rd-largest metropolitan area, bigger than Austin’s, Indianapolis’s, and Milwaukee’s. It’s second only to New York as a financial center, and is home to Bank of America. Charlotte, in other words, is hardly a backwater, any more than Atlanta or Nashville or Richmond is, but perceptions abide. Maybe that’s not all bad, at least to those of us who want the South to remain – in some sense if not all – the South, distinct and of a piece with the best of its particular history. Even if the rest of that South isn’t at all sure how the Old North State fits in. 1 To be fair, that number falls below the figures for the rest of the Southern states, except Virginia, which is damning by faint praise at best. 2 I said back, “Watch it now,” in that smiling, friendly, no-but-seriously-you-better-watch-it-buddy kind of way that men have; it was the only response that would have satisfied him. 3 To preemptively answer my children and all others who would question my knowledge of pop culture, this conversation took place a long time ago.